Auditing and market research are important for companies to get an insight into how they perform in the market. When doing an audit suppliers often check if retail stores keep to the agreement which they make, such as the display of a product for instance. With market research companies gather deeper insights about costumers’ needs and preferences, to be able to make strategic decisions for the future. Although both insights are valuable for companies, these methods are not always practiced due to their high costs. BeMyEye is a research company that offers a platform where companies can obtain street-level data from physical stores, through crowdsourcing. Within this platform, these companies, which are called the ‘clients’, offer tasks to the users of the platform. This obtained data is used the clients in various ways such as; to check whether stores are fulfilling their arrangements, how prominent their products are being displayed, how much stock there is still available from a particular product, and to collect street-level data for mapping enrichments or to identifying new opportunities for the company. This type of crowdsourcing is called information pooling. Within this type, contributions are characteristically identical and the crowd is usually asked for their opinions or to gather location-based information (Blohm, Zogaj, Bretschneider & Leimeister, 2018). This revolutionary way of auditing and market research is interesting for companies because it has a high degree of reliability and is much more efficient and cheaper than current methods. This reliability is partly obtained by deliberately allocating the tasks among a large group of people with both customers and non-customers of the product. Customers who also use the product, to which the task relates, could be positively biased when they provide the client with their perceived data, because they could be a huge fan of the brand. BeMyEye’s business model and how it works. BeMyeye uses a two-sided platform. On one side of the platform are the companies which offer various tasks which they call ‘clients’. Examples of well-known clients include Nestle, Samsung, Heineken, Lavazza, and Coca Cola. And on the other side are the BeMyEye app users which are called ‘the eyes’, these eyes could be described as ‘secret shoppers’. As soon as the clients need information about certain things in the market, they write a task and set a reward for completing this task. When the consumer logs in on the app on his phone, he sees where there are tasks in the vicinity of his current location and which rewards have been allocated. Assignments often include submitting photos of certain shop displays and completing a corresponding questionnaire. One of the newer tasks that can be assigned on BeMyEye is checking your brand reputation. Here, the eyes reveal the preferred brand choices and reasons of influential retail staff, such as a pharmacist, when approached by customers. When eyes start with an assignment, they check with their current location at the destination of the task as proof that they are in the right place, then they answer the questions the app asks them (O’Hear, 2018). These questions function as a step-by-step guide to be able to standardize the collation of the data which the clients receive. Fees usually vary from three to sixteen euros depending on the duration and level of difficulty of the assignment. After the assignment has been carried out, it needs to be verified, and when everything is fine, the eye will receive his reward and will be paid directly. In this way, companies can quickly obtain data from multiple geographical locations and no longer have to hire auditors who physically go to stores, which is often time-consuming and inefficient. In this way, companies can reduce their related costs, which can significantly improve their ROI for these business activities. This is an interesting concept for the eyes because they can quickly earn some extra money while already being at a certain location. BeMyEye earns money within this concept through a certain fee per completed assignment that they receive from the companies. BeMyEyes now has more than 1.5 million active data gatherers in more than 21 countries and are currently the largest crowd of real-world data gatherers in Europe. In order to enlarge the network, BeMyEye uses an aggressive strategy to quickly obtain more data gatherers. They do this by offering people a new way to earn something in a fun way, and by acquiring similar business models that have large numbers of active users. They started with this strategy in 2016 when they acquired Local Eyes, which was a similar French mobile crowdsourcing app. Shortly after that, they acquired other competitors such as Task360 in 2017 and Streetbee at the start of 2019 (O’Hear, 2019). With these acquisitions, they did not only take over the business models and users, but also the supporting employees, who helped the company grow even faster due to shared knowledge. These acquisitions are financed with money that the company has raised in several new financing rounds. Now, the company’s biggest focus is to maintain its market position in Europe and to enter the US market to further expand its platform (Kharpal, 2016). Nowadays, most questions the eyes get while performing a task are easy to answer and do not require any knowledge about the products. However, the question is how far could BeMyEye go. To what extent are ‘normal’ people capable of answering questions that need a certain level of interpretation or expertise? And how can BeMyEye guarantee that the questions which are asked to the eyes are correctly interpreted? I think this way of auditing will become the standard for consumer products in retail stores because of its efficiency and low costs. However, it should be examined in the future to what extent ‘normal’ people can be used for these tasks, or how they possibly could be trained. GE crowdsourcing platform – Let’s set the collective brain on fire! We live in a fast-paced digital world and it can be challenging for companies to keep up with the speed of today’s ever changing digital era. However, new information technologies have also empowered more technologically savvy businesses by giving them new means to operate, promote their products and services, and engage with customers. One company that is constantly taking advantage of these new tools is General Electric (GE), an enterprise who has succeeded in part because of its willingness to take risks and embrace innovative technologies. The most recent example of this mindset is Fuse, their new open innovation platform that launched in late 2016. It is basically an open crowdsourcing platform, which allows users from all around the world to collaborate with each other and work with GE engineers to solve meaningful technical challenges. The first step is for the Fuse team to translate GE customers’ needs and “pain points” into projects on the Fuse platform. Whereas most projects are straightforward and thus directly released in the form of challenges, some appear to be less clear and hence are uploaded on the “Brainstorming Section” of the Fuse platform as “potential challenges”. These potential challenges include a (rather extensive) description of the problem to be tackled as well as precise requirements for the solution, and contributors are asked (1) whether they would be interested in such a challenge, and (2) what additional questions the Fuse team should answer before launching the challenge. Based on the feedback received, the Fuse team might decide on further actions. When released, each individual challenge comes with a description of the problem, clear requirements for solution submissions, judging criteria, a timeline, a description of the prizes for the winners, and the official rules of the competition (including property right issues). In a second step, contributors from all around the world are invited to submit innovative contributions. Note that even though anyone can sign up and take part in challenges, the very technical nature of the challenges serves as a skills-based filtering mechanism as only people with a certain degree of knowledge in engineering would be able to understand the challenges. Once on the Fuse platform, anyone can have access to all the relevant information related to the challenges, however only registered users are allowed to submit entries. During the whole duration of the challenge, contributors can use the discussion board to brainstorm together or ask the competition holders questions. Not only does the Fuse team rapidly answer these questions and provide regular feedback/input, but they also organize “live Q&A sessions”, during which the participants can submit questions that are answered live in a video feed. The final step is for the Fuse team to evaluate the submissions, select the winners (generally the three best entries) and allocate the money prizes. The interesting entries are also forwarded to GE’s technical team, where they are further developed into implementable solutions. In less than two years, GE succeeded in creating an innovative community and successful products from their contributions (Picklett, 2017). This was made possible for the following reasons: combination of extrinsic and intrinsic incentives, good management, and well-structured governance including the mechanisms recommended by Blohm et al. (2018). From a contributor’s perspective, the Fuse platform and its challenges are interesting not only because of the cash prizes, but also because it is designed towards building long-term relationships with its contributors. For instance, competition winners actually have an opportunity to further work with GE engineers on implementing their designs (Kloberdanz, 2017). In addition, there is also an attractive physical part to Fuse projects, which consists in a micro-factory in Chicago designed for rapid prototyping, small-batch manufacturing, and modular experimentation (Davis, 2017). This faculty will be open to contributors and can constitute an incentive for them to become part of the Fuse community as it is a good opportunity to bring their ideas to life, work with GE professionals, and meet like-minded innovators. Finally, the Fuse challenges are also a good opportunity for contributors to collaborate with other brilliant mind, expand their business network, build their professional reputation, and gain recognition from their peers. From GE’s perspective, the Fuse platform is a new source of innovative and ideas, which can speed up content creation, cut R&D costs for the company, and provide GE with an opportunity to spot talents who might be valuable additions to their team. But how is GE able to overcome the challenges inherent to crowdsourcing (e.g. huge quantity, low quality, free-riding behaviour, risks of sharing information)? First, due to the technical nature of the Fuse challenges, the clearly defined guidelines provided to the participants, and the rapid feedback/additional inputs provided during the competition, GE ensures that only a manageable number entries of a certain quality are submitted, thus facilitating the evaluation process. The platform is also clear about the transfer of PI rights, which avoids troubles along the way. Second, for most challenges, challenge, entries are private and only viewable by the creator, admins, and judging panel. As a result, GE is able to avoid free-riding behaviours. However, contributors are still able to communicate with (and help) each-other via the discussion board, and the Fuse team makes sure to encourage the discussion with feedback and additional information, hence allowing contributors to still learn from each other. Finally, even though opening up GE’s internal workings/information of some products in order to run these challenges can be risky, the company acknowledges that “there are certain risks you just have to roll with if you want to make progress and that willingness to take those risks is what makes this exciting.” (Davis, 2017). This quotes shows that GE understands the need to willingly take risks in order to continuously transform the company and, so far, Fuse seems to be worth it as GE reunited more than 8000 contributor successfully implemented several ideas generated by the platform in less than a year (Davis, 2017). In summary, the joint profitability criterion is met as the Fuse platform creates value for both GE and its contributors. Furthermore, the costs linked to this innovative business model are relatively low as the Fuse team only consists of 4 employees based in Chicago (Pickett, 2017). However, as the platform matures, hosts more challenges, and attracts more contributors one can assume that the number of employees will have to increase. Still, the costs-benefits ratio should remain interesting compared to doing everything in-house. Finally, the legal concerns are taken care of thanks to inclusion of PI agreements in the official rules of the Fuse challenges, and the social norm dimension is met as GE is a well-known, reputable brand, hence building trust with contributors. “This start-up built an alternative education system that’s poised to have a major impact on the learning landscape” (Tracy, 2017). Learning should be as easy as listening to music at Spotify or watching your favorite movie on Netflix. Skillshare is really about learning by doing and every class is project-based as well. Students can create projects, alter them to the website and can get feedback from students all around the world (Skillshare, 2017). Thus, unlike other educational online platforms, you don’t need to have a Ph.D. to teach something valuable. And on the other hand, learning skills is for everyone universal accessible and relatively inexpensive. It is for everyone easy to become a lifelong learner.The mission of Skillshare is to close the professional skill gap and provide universal access to high-quality learning (Skillshare, 2017). They believe that there is a huge difference between education and learning. Skillshare empowers people to take a leap in their careers, improve their lives and pursue the work they love, by teaching skills online that are needed in tomorrow’s world. This mission directly shows the major strength of Skillshare and how they differentiate themselves from competitive education platforms. Skillshare allows everyone to sign up and teach a class. By doing this they want to provide universal access to high-quality learning. For the lifelong learner, Skillshare makes it possible to get universal access to high-quality learning and to learn anything they want to. They offer the possibility to watch classes, online and offline, on your own schedule, anytime and anywhere. Thus they make it possible to learn at your own pace. Furthermore, the classes are taught by an expert with experience in the field. These classes include video lessons that are relatively short with most lessons under one hour, written text. And with the project-based environment you really learn by doing and are able to share your project in the class to get feedback and collaborate with a large community (Skillshare Help, 2017). They offer their members the possibility to create projects and build a portfolio of their work. On the other hand, Skillshare makes it possible for everyone to share their knowledge in a particular field, as long as the class follows certain guidelines. The company has proven adept at acquiring experts to teach on their website (Bromwich, 2015). Skillshare has a freemium model which allows users to access free classes, create projects and discussions within them. However, this model includes videos with advertisements. A premium model offers their users to get unlimited access to over 14,000 classes, watch them offline and ad-free (Skillshare Premium, 2017). Skillshare is one of the leading educational platforms that offers everyone universal access to learn a new skill at an affordable price. The platform maximizes the joint profitability of both of the players involved (Carson et al., 1999). On one side, it is for individuals easy to reach a large audience and teach them a skill of their experience. They are not bounded by a physical location anymore and therefore can have a more efficient personal schedule. Additionally, they can earn a little to a lot. On the other side, many individuals can learn and practice a new skill at an affordable price. At the same time, they can collaborate with a large community and get feedback from them, so that the wisdom of the crowd can be used. Evaluating the institutional environment, the largest threat for Skillshare is that there are too many new teachers who don’t add value to the platform. However, because there are guidelines and requirements that should be met before a class can be created, this threat is limited. Concluded, Skillshare is an online platform that offers universal access to high-quality learning at an affordable price. Bromwich, J. (2015) ‘Anyone Can Be a Teacher at Skillshare, an Online School, The New York Times, available online from: https://www.nytimes.com/2015/03/20/education/anyone-can-be-a-teacher-in-this-online-school.html?_r=0 [28 February 2017]. Carson, S. J., Devinney, T. M., Dowling, G. R., & John, G. (1999) ‘Understanding institutional designs within marketing value systems’, Journal of Marketing, 115-130. Howe, J. (2006) ‘The rise of crowdsourcing’, Wired, 14 (6). Joyner, A. (2017) Skillshare Takes On the Education Gap, available online from: http://www.inc.com/best-industries-2013/april-joyner/skillshare-education-gap.html [28 February 2017]. Tracy, A. (2017) Skillshare: Redesigning Education for the Masses, available online from: http://www.inc.com/abigail-tracy/35-under-35-skillshare-online-education-platform.html [28 February 2017]. Skillshare (2017) Unlimited access to over 14,000 classes, available online from: https://www.skillshare.com/ [28 February 2017]. Skillshare Help (2017) How does Skillshare work?, available online from: https://help.skillshare.com/hc/en-us/articles/205208147-How-does-Skillshare-work- [28 February 2017]. Skillshare Premium (2017) Why Premium?, available online from: https://www.skillshare.com/premium [28 February 2017]. Facebook, YouTube, Instagram, Wikis, Twitter – Social media (SM) are everywhere. Those websites and applications allow the creation and exchange of user-generated content in a community setting (Kaplan & Haenlein, 2010). The users are not only private people, but also companies are exploring SM as a tool for commercial success. Next to outbound marketing, SM are also applied to enhance business interactions as part of the innovation and product development process (Kenly & Poston, 2011). However, so far new product development (NPD) through social media channels can only be observed anecdotally. Specialized consultancies also jump on the train and offer their services to get a piece of the pie (Accenture Interactive, 2017). But how nourishing is this pie? Gathering information from SM channels can lead to higher performance, but only when embedded in complementary, formalized processes. A defined structure and sequence for the flow of activities provides control, helps to reduce uncertainty and mitigates risk. The relationship between SM usage and innovation performance is not entirely positive. An extremely broad application of SM results in a negative performance effect for all kind of innovation projects. The relationship between seeking market-related and technology-related information in the open innovation context is complementary. Leveraging this dependency has a significant positive effect on NPD performance. SM is better suited for gathering need information than for accessing solution information. Depending on the information needed, the explicit SM channels (forums, social networks, blogs, wikis etc.) differ. These findings imply the positivity of SM for a firm’s innovation performance. But I personally doubt its large-scale effectiveness. After having screened the literature for mentioned best-practice examples, there are enormous differences between companies in how they leverage and exploit benefits of SM usage for innovative efforts. The involvement of customers into new product creations for consumer goods rather resembles the characteristics of a marketing or market research tools. Haribo asked its fan base to vote on new flavors for a special edition during the 2014 soccer world cup. Home-appliances manufacturer Liebherr invited its customers to participate in a fridge-design competition. In contrast to that, I found technology-oriented companies, like NASA, or IBM in collaboration with Topcoder, to give their followers far more influential power by posting demanding challenges. This is surprising, because the study stated SM to be more suitable for gathering needs than (technical) solutions. So, is there a difference between industries concerning the successful integration of SM in NPD? Are technology companies simply more knowledgeable in utilizing SM? Or are their users simply identifying more with the product and thus engaging in NPD processes? The multitude of questions call for a further investigation of the results in relation to different industries and specific firm capabilities in dealing with SM. Hence, up to now how nourishing and likely this cake for businesses and consultancies is, might still be questionable and has to be answered for individual initiatives specifically. Kenly, A., & Poston, B. (2011). Social Media and Product Innovation: Early Adopters Reaping Benefits amidst Challenge and Uncertainty. In A Kalypso White Paper. Kalypso. Roberts, D. L., Piller, F. T., & Lüttgens, D. (2016). Mapping the Impact of Social Media for Innovation: The Role of Social Media in Explaining Innovation Performance in the PDMA Comparative Performance Assessment Study. Journal of Product Innovation Management, 33(S1), 117-135. Crowdsourcing information systems aims at delivering informational products and services by harnessing a large group of online users. Individuals motivated intrinsically (e.g., enjoyment) or extrinsically (e.g., reward) can contribute to the system through picking among a variety of open tasks on crowdsourcing platforms. As the huge amount of tasks posted ever day, matching individual with an appropriate task that meet up individual’s personal preference and skill is crucial to the success. However, in reality, the ever-increasing amount of opportunities engaging individuals on crowdsourcing platforms lead to an information overload situation. Therefore, how to assist contributors in finding a suitable task in line with self-identification principle has attracted scholars and practitioners’ attentions. Geiger and Schader (2014) review and analyze the current state of personalized task recommendation in crowdsourcing context which shed a light on designing the relevant mechanisms on crowdsourcing platforms. Have you ever been in the situation where you were scrolling through your Tumblr or Instagram feed and you suddenly came across a photo of someone wearing a clothing item you would really like to buy, but have no clue where the item is from? And you are not in the mood to spend the rest of your day hunting this item down or directly asking the person wearing it does not work? Well, forget the wasted time and awkward comments, because Wheretoget.it lets other consumers do the work for you! Haarlem is a city located in the Netherlands and the capital of the province of North Holland. With a population of 155,000 it belongs to one of the bigger cities in the Netherlands and should have enough possibilities/resources for crowdsourcing a 3D Printing project, at least that’s what Max van Aerschot should have thought when he lauched his “Haarlem” cityprinting project. Max van Aerschot, appointed to be city architect of Haarlem after fulfilling different projects, advised the town councils to focus on the east parts of the city. In his opinion, this part of the city has been forgotten since the late 60’s and citizens should be involved during initiatives for town planning. With co-building a city model, in the form of a 3Dprinting project, allows Max van Aerschot to show citizens what’s going on and how the future town planning of Haarlem looks like. After six years of walking around with his initial idea, Max van Aerschot launched the 3D printing project in collaboration with a few specialized companies and a lot of cizitens. The model would be built at a scale of 1:1000 and devided in 600 “puzzle pieces”. Making use of the crowd to create a city model is a wordwilde unique concept. Upon that, using the 3D printing technique makes it an extremely innovative crowdsourced 3D Puzzle project. Crowdsourcing is the process of getting work or funding, usually online, from a crowd of people. The word is a combination of the words ‘crowd’ and ‘outsourcing’. The idea is to take work and outsource it to a crowd of workers. The choice for outsourcing the development of a cityprinted model of Haarlem to the crowd has several reasons. As told earlier it is a tool for communication and creating citizins involvement in town planning initiatives. Secondly, and probably one of the main reasons : 3D printing technique is a relative promising new technique however it allows Max van Aerschot “in collaboration with the crowd” to build the city model as it is nowadays at a scale of 1:1000. This project couldn’t have been done with old techniques due to a lack of time and financial resources. Besides the financial plusses, a lack of time is still a main reasons for crowdsourcing. The project couldn’t be a success without the crowd because of the lack of speed at which 3D printers work. Using open-source data from the kadaster, allows the initiatiors to devide the city plan in +- 600 pieces. This digital ‘puzzle’ is created in a way that every piece (18cm x 18cm) of the puzzle can be 3D printed with a (normal) 3D printer. This allows everyone who is owner of a 3D printer to participate in the co-creation process. As pictured above, everyone who want’s to participate in the crowdsourcing project, can assign on a specific piece for creation. On the map : Blue = Free, Orange = Assigned but still needs to be print, Green= Printed. After assigning on a specific “piece” participants will be provided with PLA (source for 3D printing) to print their assigned piece. The 3D printed part of Haarlem needs to be handed in at 3DMM (project – partner) to complete your role as a co-creator. After fulfilling the whole process, participants are rewarded with a place in the wall of fame and will obtain eternal fame on the first crowdsourced 3D printed city model. “Style your Smart”: How a not so successful car brand learned us how to successfully generate ideas. Five years ago, when consumer co-creation was not yet the hot topic it is today, Smart launched a very successful co-creation contest. 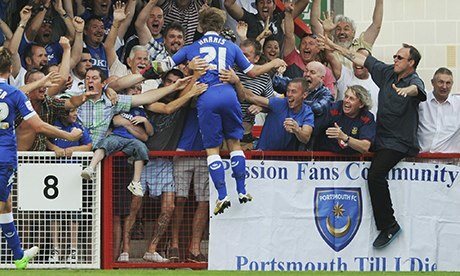 Do you still remember Smart? The little city-cars, which eventually were not the success that the company had hoped for. 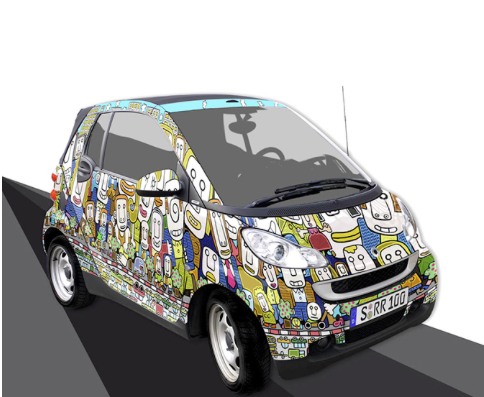 In 2010 they launched a co-creation contest in which consumers could participate and make a design for the Smart car. They did not only engage their consumers in making the best design, but also engaged their consumers in a little game so they could help decide which design was the best. This approach of gamification did not only help Smart to engage more customers in this co-creation process, but also led to high quality designs and have strengthen the bond between consumers and the brand Smart. For companies co-creation has a lot of advantages. Consumers create value for companies and products. Consumers express their needs, they help the company with (creative) ideas and companies can engage their consumers in deciding which product to launch next. 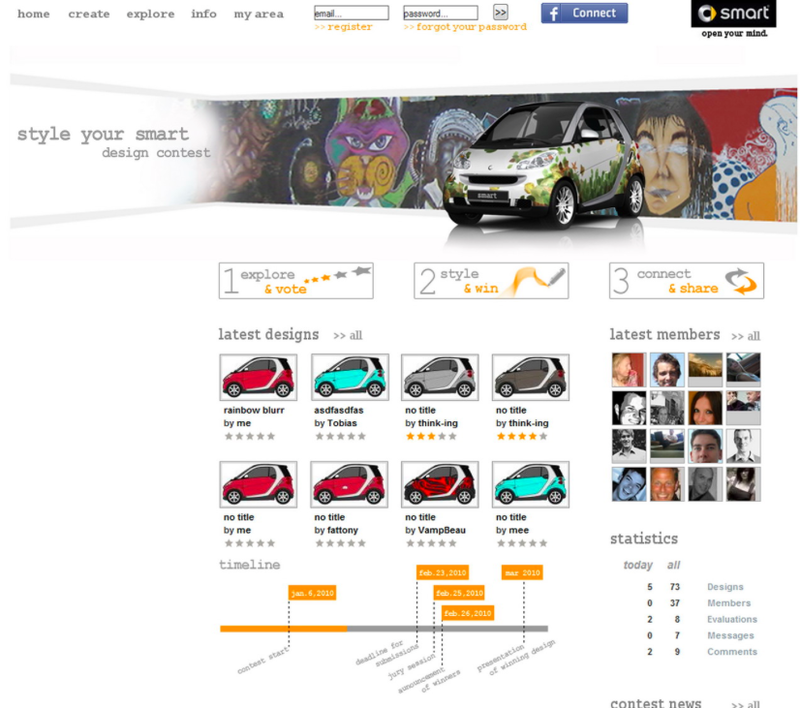 In February 2010, Smart launched the co-creation contest in which consumers could upload their design for the Smart car. The winner could win a monetary reward of $5000. They made an internet platform with a design tool so that even consumers with no experience in designing cars could participate. Besides that, they directly involved customers with the platform by allowing participants to comment on designs and rate different designs. In only a few months, 10.000 members uploaded 50.000 designs to the website. There were 600.000 design evaluations and 27.000 comments. 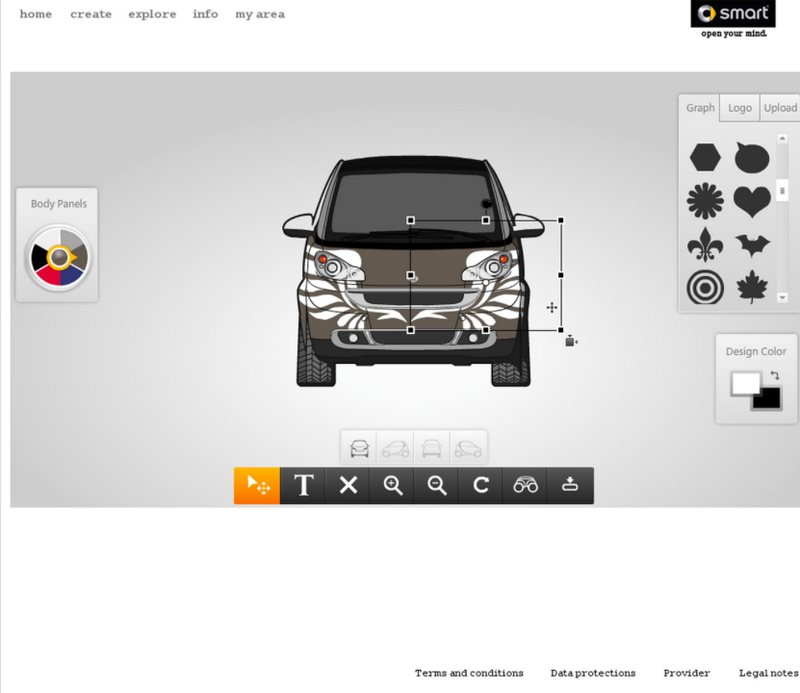 Smart did not only engage their consumers in designing the Smart, but they also thought: Why not let our consumers choose which design they like the most? Unfortunately, these decision-making processes are often perceived as boring by the public. Therefore Smart decided to gamify this contest. Gamification is a way to make things like an idea generating contest more appealing for the public. Games are often perceived as fun so they are a good way to get more engagement from consumers. If we look at the statistics we can conclude that Smart launched a very successful co-creation contest which had a monetary reward of only $5000. Is the only trick they used to include gamification of the process? Or do you think that gamification is absolutely not a guarantee for succes?